The Oyster Festival, the Capoeira Festival and Batizado, the Guayafest, the Laser World Championship, the Salsa and Mambo Festival, the Open Water Swimming Tournament and the Children’s Fishing Tournament await you in the Riviera Nayarit. 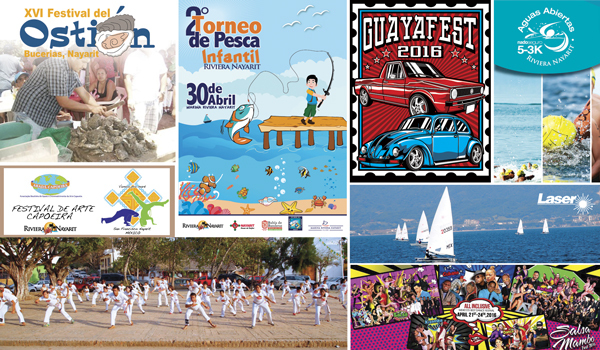 Every month the Riviera Nayarit Convention and Visitors Bureau keeps you informed on the latest happenings in the area: this April is busy with sporting events, festivals and much more for everyone to enjoy! Rincón de Guayabitos will be host to dozens of classic, modified and tuned-up Volkies, which will take center stage during this unique festival in this lovely seaside village. The first two of four phases of an international event that brings together the best sailors in the world will take place in April: first the Laser Women’s World Championship followed by the Laser Masters World Championship – Radial, both in Nuevo Vallarta. This fabulous event returns to Nuevo Vallarta as it does every year, bringing with it the best salsa players on the continent to share their rhythm and talent, not to mention have some super fun times in Mexico’s Pacific Treasure. One of the most intense competitions in the Destination takes place in La Cruz de Huanacaxtle. It’s quite the show to see the swimmers break the line and race to be the first to reach the finish.